An interesting question which is remarkably not enough discussed in evaluation studies is: what characteristics of schemes, projects and applicants determine the success of R&D instruments. Understanding these features can make economic policy stimulous more effective, but empirical data is scarce. In this context, the Interprovincial Consultation (or Interprovinciale Overleg – IPO) has commissioned Decisio to explore the “success factors” of schemes. Success is defined as “the support generated (or retained) through sales and jobs”. The second question asked to Decisio was which evaluation and monitoring methods should be used to answer the question above. The exploration consisted of a literature research, study of previous evaluation projects conducted and discussion with project leaders and experts. 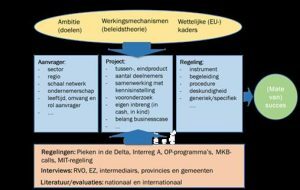 As cases under the MIT arranagement included, the “Delta Peak”, Interreg and Operational Programs. The talks and case studies provide an indication that arrangements are more effective as more customization, demand management and selection are possible on successful business cases. However, an ex-post quantiative evaluation of the degree of influence of these aspects is a costly matter. Thus, we advised to set up a monitoring system that keeps track of information prior to, during and after the supported projects. The set of indicators is limited in size and the input of the requested information can be incorporated fairly efficiently into the RVO project registration system. For more information about this research, please contact Jaap Broer, j.broer [at] decisio.nl or via 020-6700562.